We are outside of the fabulous fun restaurant I shared with you last week here. Koi and Tilapia competing for food at “Razzos the CajunRestaurant’s” pond outside the restaurant. It was gorgeous…this restaurant sure knows how to entertain…while you wait for your table. Koi ponds are ponds used for holding koi, usually as part of a landscape. Koi ponds can be designed specifically to promote health and growth of the Nishikigoi or Japanese Ornamental Carp. The architecture of the koi pond can have a great effect on the health and wellbeing of the koi. I couldn’t help thinking as I observed the fish…how many of us sometimes get ourselves in a frenzy over the silliest things too? It is so much easier seeing someones else’s behavior acting irrational…but can we see ourselves not behaving rationally? We live in a very tourism city, to say the least! The traffic has tripled in the last few months…would you like to ask me… if I am acting rationally when I am on the road, trying to drive home from a long day of work? Sigh…how silly of me! This too shall pass. Part 2 – Collages for portrait images. When using portrait orientation images, meaning vertical, going from top to bottom. It is best to use them in a collage of two or four. We have talked in the past to size your photos for the templates format…BUT in portrait mode…it makes the vertical image SO huge to view. You have to keep scrolling to view the whole picture. It starts losing its meaning. The mind forgets already what it has already seen to complete the composition. This is a great solution to a too small of a photo problem for your blog. Make your template the width of your blog, and drop in your gorgeous photos. If this is your first or second time to visit, we invite you to join Pride in Photos by email. This way you don’t miss the Tip of the Day! Go to the top right hand corner of the blog and fill in your email address. Beautiful shots. Visiting late for MoM. Happy Tuesday. you did capture the moment!beautifully. Water shots make such interesting photos. Thank you for linking up this week. Wow, I love your pictures. I pinned this! Hope to see you back at Tuesday Trivia next week. Interesting series of images. I love the color of that blue water! Visiting from Walk & Click. 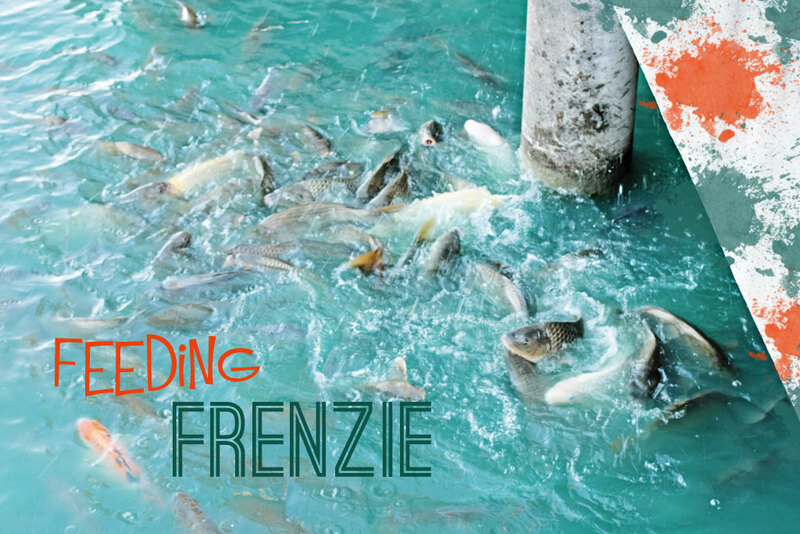 Love your Koi images, Laurie … and your choice of font is perfect for “feeding frenzy”! And I thought my hawk pictures today were cool. This beats mine by a mile, as shooting water is so difficult (at least making it look good in the end is hard). 😀 Thank you for linking to the GRAND Social! Great post! Fun restaurant to visit. Great tip of the day as always. Your photos makes me miss KOrea. We used to feed the Kois and other fish in the pond when we were still living there. Trying to catch up with Camera Critters entries. Hope you’d stop by and post a comment on my BUTTERFLY entry. Hi Laurie, what a movement under the water – I’ve never seen Tilapia fish before! I love your tips – making those collages is a bit tricky every now and then – to get the harmonious and balanced look. These are awesome shots! They almost look unreal. And you’re right about how frantic we get (raising my hand here!). Visiting from The Grand Social. I’ll be back soon. I’m always looking for photography tips. We love the Razoo’s in Houston. Our Granddaughters love to see those fish. Sure is a feeding frenzy! A little different than the Koi pond in my cousin’s back yard, which is small and calm. I could use more of the latter in my life. As we all can! I just love the color of the water! You really captured the feeling of a “frenzy” here! And I love the blue/orange colour combo – a real fave! Great photos, and some good insights, too! Thanks for your photo tip. I do not think I want to get in the middle of that even if they do not have teeth. Your photos are gorgeous, I am just learning and finding out how complicated good photography is, I am going to follow you so hopefully some of your talent will rub off! Wonderful a new friendship begins!! Welcome! There are SO many good ones out there. I would start with Kim Klausens or Jessica Spragues. Beautiful shots. Must have been fun to watch them feed. Koi is another word for ornamental Carp. 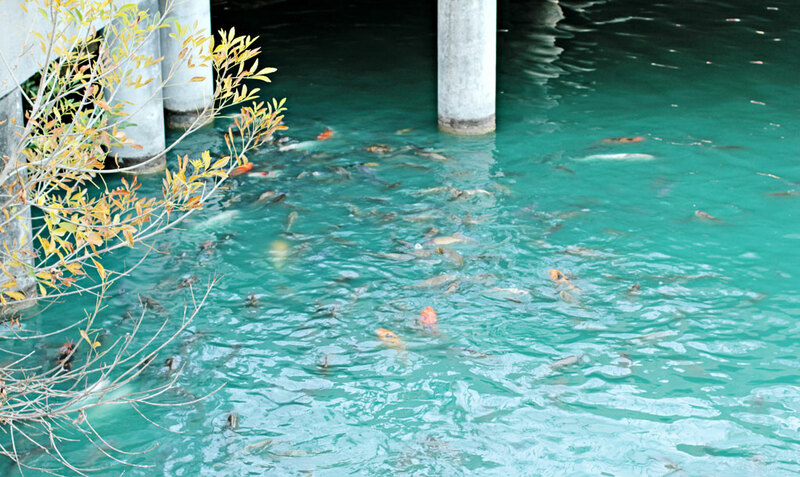 Your photo reminded me of a news topic of recent, the Bighead Carp and Silver Carp, both introduced from Asia have found their way into domestic waterways and are taking over…they eat everything in site. 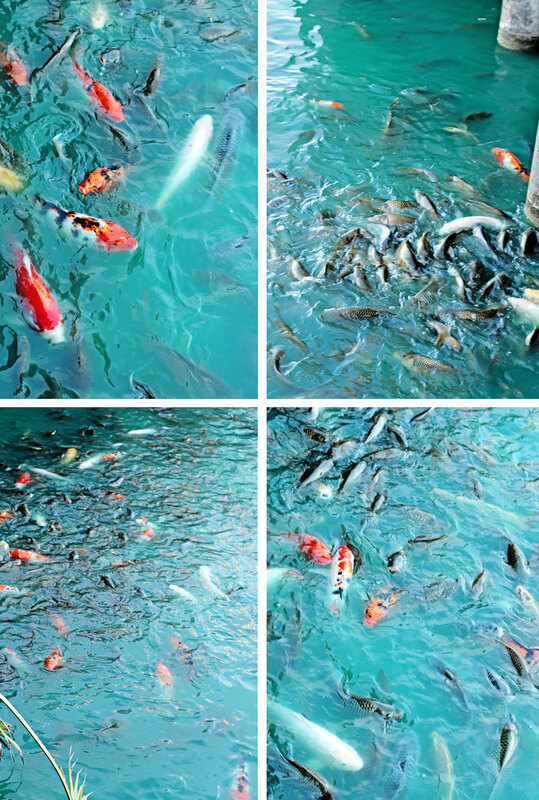 Millions are being spent by both American and Canadian governments to save the fisheries industries and battle the infiltration of this fish…just thought that was interesting to these koi being such aggressive eaters. I love your feeding frenzie photos, as much as i love playing feeding frenzy as well! great pictures of the koi. I love to watch koi! Great shots and tips!! There is definitely a “wild excitement” evident in these photos! This picture was perfect for the first day of 2nd term classes! I love it!! It was a frenzy of a day. All kidding aside, your photography is gorgeous. I love the colours of the fish and the water ripples! Oh I once witnessed a feeding frenzy in Galveston with catfish…it was not a pretty sight. And I do have a dilemma when it comes to posting vertical images. That photo so well made. It’s a great job, I love fish. Great series, Laurie. The color of the water is amazing. Excellent tip on the vertical portrait, I find myself trying to avoid posting vertical shots because like you said, they come out really huge. That water is such a pretty colour! Nice shots. Kois are terrible ! they are always hungry ! How fun, Laurie. Love those colors! 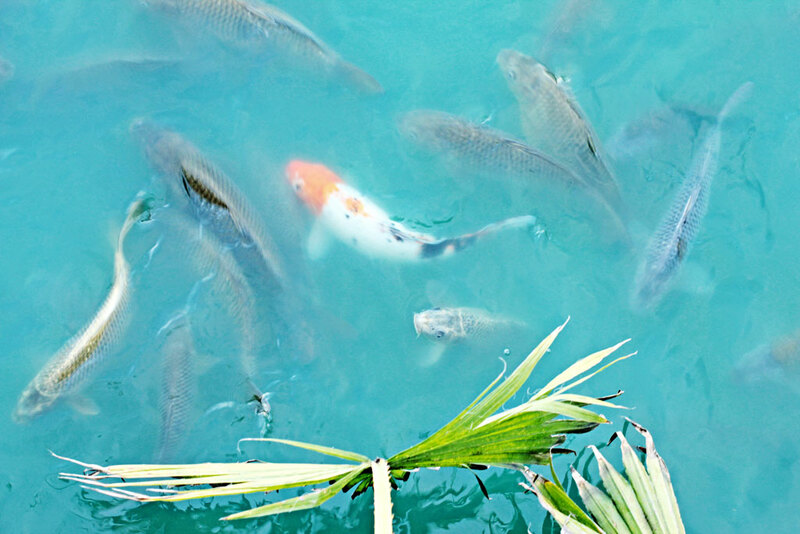 awesome shots of the koi–the water is such an appealing color, too–and I know that type of stuff is way dynamic ’cause of silt and wind and whatnot–also dug that you addressed the size of jpeg to use!! Yes, by all means fill up your blog post when posting photographs you own–matching text and picture margins are so polished looking, I think, and if I am looking at a picture, I want to see it, not squint at it!! That is an amazing story!! Thank you for sharing it. Great tip! I need to do this for my vertical portraits which are huge. It really irritates me. I may have to ask you about a step by step on that later. I avoid using vertical orientation pictures on my blog because they are so huge! I love watching Koi. They make me feel relaxed. Kim, I would be glad to help you! that certainly is a feeding frenzy! Have a wonderful week. That first picture is awesome! What a cool series of shots! I just learned this in class about vertical pics, so I wanted to share it. Did you get to feed the fish too?